It’s here! Our Windows 10 Superguide is finally released. Now you can effortlessly master the biggest and best version of Windows ever with our Windows 10 Superguide DVD-ROM or digital download! $20 (download version) – Click here to buy through ClickBank. For technical support and updates to this product, click here. 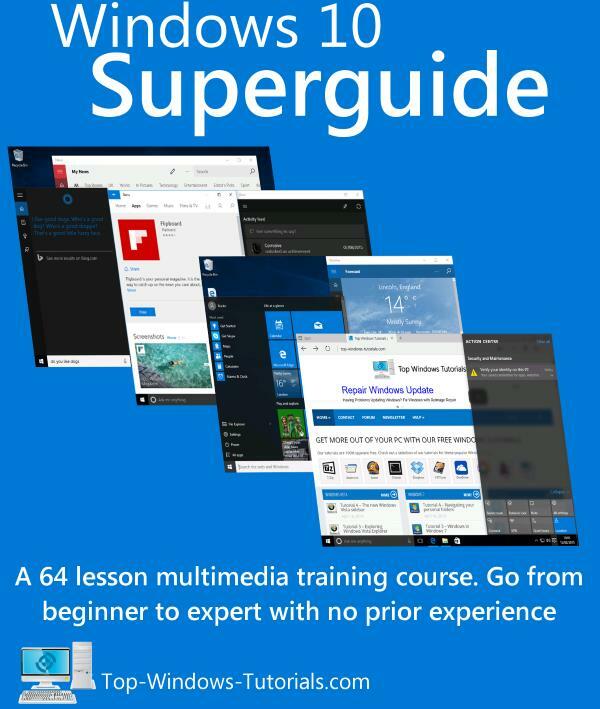 The Windows 10 Superguide is the newest addition to our successful range of Superguide training courses. These guides are designed to offer training courses for those of you who want to master a certain topic or application. You can read more about the Superguides by clicking here. It’s time for ten! Windows 10 is ready to take you and your PC into a fantastic new age of computing. No matter if you’re running a tiny tablet or laptop or a super powerful desktop, Windows 10 will make the most of your PC, empowering you to do more than ever before. In this guide, we look at Windows 10 on both touch enabled devices and traditional, keyboard and mouse equipped PCs. The Windows 10 Superguide is our biggest and best guide yet, with no less than 69 high definition video tutorials across 70 lessons. Our newest video player automatically scales each video to best fit your screen and all videos can be played in full-screen mode too. That’s not all, each and every lesson comes with full written notes and the guide also includes 46 pages of exercises and self-test lessons. However you want to learn, we’ve got your back! The Windows 10 Superguide is the third of our Superguides to be endorsed by The Federation of SeniorNet Societies New Zealand for use in its 90 learning centres across New Zealand. We are proud to support SeniorNet New Zealand with our latest Superguide and delighted to show their endorsement of it. For those of you who need help with your basic computer skills, we have revised and updated our beginner tutorials. Start right at the beginning and learn about the keyboard and mouse, or dive right into the Windows 10 lessons, the choice is yours. Unleash the true potential of your new Windows 10 machine with the Windows 10 Superguide. Find out why individuals, businesses, schools and learning centres all over the world love and trust our Superguides. There really is no more thorough, concise or better value course available anywhere! The download comes in two parts, you should download each part and back them up immediately. The digital download version is priced at $20 US Dollars and of course you pay no postage or delivery charges. Use the button below to buy the Windows 10 Superguide digital download through Clickbank. Your payment details will be secured using Clickbank’s SSL encrypted server. Remember that with this service you will receive a download link only, you will not receive a physical product. Note that your credit card will show a transaction from Clickbank, not Top-Windows-Tutorials. We offer very competitive discounts for bulk purchases from corporations, schools and colleges, businesses, charities or government entities. For details, please contact us here. Windows and Windows 10 are registered trademarks of Microsoft Corporation. This site and the products and services offered on this site are not associated, affiliated, endorsed, or sponsored by Microsoft, nor have they been reviewed tested or certified by Microsoft. Customers can now submit their own reviews for the Windows 10 Superguide. We welcome any feedback, good or bad! If you have purchased the Windows 10 Superguide and would like to leave a review for other customers to read, please click on the “Create your own review” button below. We will publish all genuine reviews and moderate for offensive language/content only. Note - This review was submitted for the Amazon Kindle e-book version. The complete e-book is included with the DVD/Downloadable Superguide, of course. SUPERB BOOK FOR HELPING A 70 YEAR OLD UNDERSTAND WHAT'S GOING ON.